Sony and Verizon announced last month they will bring the Xperia Z4 to consumers in the United States. However, the carrier-branded Xperia Z4v comes at Verizon with enhanced specs in comparison with the standard model. It's common fact that Sony stated numerous times that it's not ready to include Quad HD displays inside its smartphones. Both Xperia Z4 and its international counterpart, the Xperia Z3+ are packed with full HD (1080p) display, which was kind of disappointing for Sony fans. However, unlike the Xperia Z3+, Verizon's version will come with a 5.2-inch IPS LCD capacitive touchscreen display that supports Quad HD (2560 x 1440 pixels) resolution. 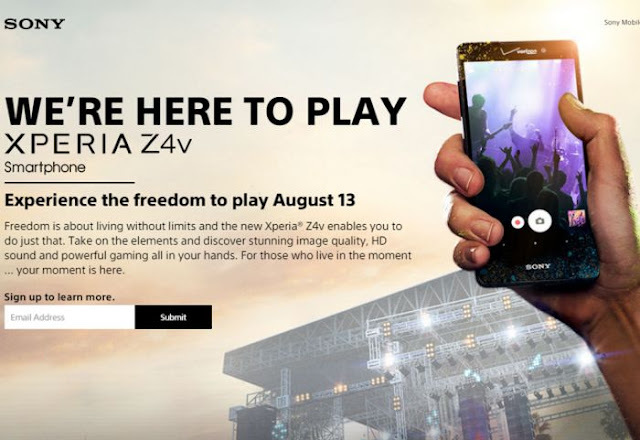 Although Sony and Verizon confirmed the Xperia Z4v will be exclusively available in the United States through the Big Red's official retail channels, they did not share any details regarding the possible release of the smartphone. Today, XperiaBlog reports Verizon confirmed Sony Xperia Z4v will be commercially available beginning August 13. One thing still remains to be unveiled by the carrier: price. We know nothing about the smartphone's pricing options for the moment, but there's a high chance that it will by slightly more expensive than the Xperia Z3+ given the slightly enhanced features. Aside from packing a much better display, the Xperia Z4v also comes with wireless charging and a slightly larger 3,000 mAh battery. The Xperia Z3+ is powered by a 2,930 mAh battery, so the difference is negligible. The rest of the Xperia Z4v specs are similar to those of the Xperia Z3+, including the 64-bit octa-core Qualcomm Snapdragon 810 processor, 3GB RAM and 32GB of internal memory. Also, Verizon's Xperia Z4v boasts an impressive 20.7-megapixel rear-facing camera with autofocus, LED flash and 4K video recording, as well as a secondary 5.1-megapixel camera in the front that can capture full HD (1080p) video.